When facing significant issues with your home such as space or damage, house lifting is often a more attractive option than the process of selling and moving or undertaking a big renovation project. Reasons for lifting a house vary from protection to reparation to expansion. In many cases, homeowners choose to elevate their houses to prevent potential damage. Do you live in a wet climate or near a body of water? You may be at risk for flooding. After rainfall, is your basement often damp? Mold damage or rot could be another threat. Don’t ignore Increasingly extreme weather conditions and changes in climate. If you have had too many close calls, consider raising your home to avoid a future disaster. In some instances, the damage has already been done. Foundation problems occur more often than homeowners may think. Damage to your house’s foundation can be caused by many things such as changes in the underlying soil, severe weather conditions or natural disasters, or improper drainage. While this is one of the more unfortunate reasons for lifting a house, hiring the right professional will make this process less overwhelming. 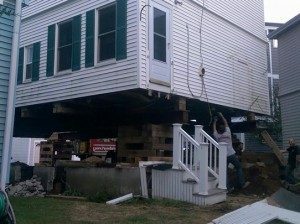 If you’re facing a problem like this and are unsure of what to do next, consult a professional about house lifting. Many people choose to elevate their homes not because they have to but because they want to. Do you love your home but need more space? Why not add space by raising your house? This is a great idea whether you’re looking for a little extra room in an existing basement or in need of adding an entire new story to your house. Other benefits of lifting include preventing infringement on your existing yard space, improving your home’s view, and adding value to your property. If any of these reasons for lifting a house match your current situation, talk to a contractor. Forego the complicated processes of moving or adding additions, keep the home you love, and find a long-term solution to the issues you face by house lifting.